Theodore Roosevelt and New Nationalism: Analyze & Write Roosevelt A Letter! Progressive Era (Gilded Age) Bundle! 11 Engaging Resources for Progressive Era! In this engaging resource, students analyze Theodore Roosevelt's popular New Nationalism speech where he criticizes how influential special interests have become in government power. Students analyze the speech individually or in a small group setting. 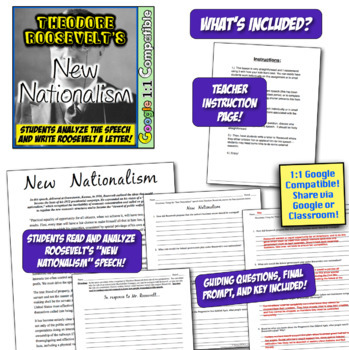 Once students have examined the New Nationalism speech, they can move on to the letter writing activity. 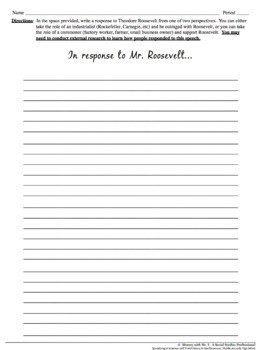 Here, students write a letter as either an industrialist (Rockefeller, Carnegie, etc.) 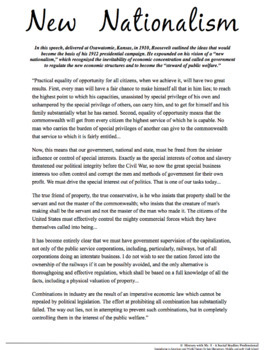 outraged by Roosevelt's speech or as a commoner (factory worker, farmer, social reformer) in support of his speech! A Google 1:1 compatible version is included in this product! Use in either a traditional setting or in the 1:1 environment! Be sure to follow the History with Mr E Facebook page, and don't forget to signup for the Social Studies Newsletter to receive information on flash sales, product releases, and classroom tips! Check out these other great resources on the Progressive Era & Gilded Age! Women's Suffrage: The Struggle for Suffrage from Seneca Falls to 19th Amendment! Civil Rights & Emma Lazarus in Progressive Era! Dawes Act & Chinese Exclusion! Progressive Era Problems: Why Did Mark Twain Name It The Gilded Age? Engaging! John D Rockefeller: Hero or Villain? Where does Rockefeller fit in Gilded Age? Muckraker Magazine Project! Students investigate the work of Gilded Age Reformers! Tammany Hall Investigation: What Was It? How Did Tammany Work? Was it Wrong? 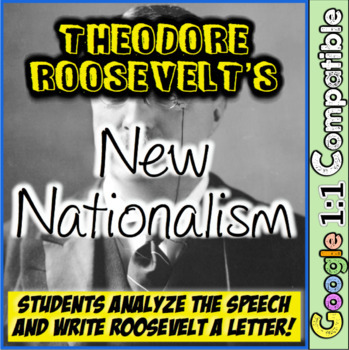 Theodore Roosevelt's New Nationalism: Analyze & Write Roosevelt A Letter! ***ATTENTION DISTRICTS AND DEPARTMENTS*** If you are purchasing for your school's department, please buy the appropriate amount of licenses. If it is purchased with school funds, it belongs to the school. If you are a large school district and you are interested in a full district license, please message me and I can work out a quote that is cheaper than what you see.